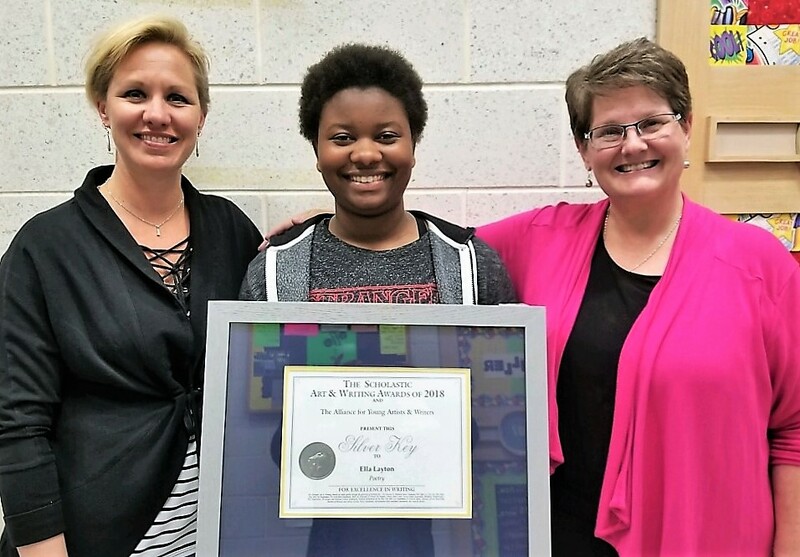 Manor Middle School eighth-grader Ella Layton has earned a Scholastic Writing Award for a collection of poems she wrote over the past year. Ella chose five poems – “Unsaid,” “Hesitation,” “Bind,” “Paradise” and “Mess” — to submit to the Scholastic Art & Writing Awards competition. She earned a Silver Key, the second-highest award, for the collection. “Each poem represents a time of my childhood or a person who is or was in my life,” said Ella. “Ella is an incredibly astute young writer who has a voice of conviction and maturity that is not often seen in a middle school student,” she said. Ella Layton with her teachers, from left, Kerri Miller and Carrie Aukamp.